On Wednesday, the Bulls named Jeremiah Ani on the teamsheet for their match with Plymouth. "He has come in and trained well, played on Wednesday with the kids at Stocksbridge and changed the game with his heart and work rate. He had the opportunity to go to Plymouth last year but the manager at the time Paul Mariner left the club. He has done a pre-season with Notts County and after we sent the circular around saying we needed a striker the manager, Craig Short, recommended him because they had too many strikers." The Millers reported on Wednesday that the side that took on Stocksbridge was a youth team with two of their younger pros and coach Paul Warne adding to the side. Hereford United Simon Davey has spoken about new signing winger Joe Colbeck who scored two goals in the friendly at Neath earlier today. "You can't ask for anymore, a wide player who's direct and scores goals," Davey told the OS. "Joe scored two great goals, he couldn't have asked for a better debut, he just needs to perform like that in the League programme. "I know I've got the right player to fit into what we're trying to do at this football club." Colbeck had his first training session with Hereford United yesterday. Two of the Hereford United youth teams won their finals at this weeks Welsh Super Cup 2010 tournament at Aberystwyth. The under 16's and the under 18's received winners medals. Colin Williams and Gary Stephens were in charge of the youngsters. It didn't take long to get to Neath. Even the directions on BN were somewhere near correct. You just had to watch the sheep on the Beacons above Storey Arms. Our only problems were that we did find the entrance to the car-park opposite the ground a little confusing. And that all supporters went through the same turnstile. The ground itself wasn't that modern and the leg-room when sat down was insufficent for anyone much over five feet tall. But otherwise a very friendly atmosphere and lovely to hear the announcements in Welsh as well as English. Where's the Beast we asked. He's in the dressing room said the new Hereford United sports scientist so we thought he was going to play. He's got an ankle injury said the new kit man so he's not going to play. Later he was sat in the stand watching the game. He was missed on the pitch. Former Swansea player Lee Trundle started for Neath. A benefactor of the club has, apparantly, put the money up to pay his £2,000 a week for the season. That's more than we pay our whole team each week noted a spy from Port Talbot. Trundle had already scored five goals in their friendlies to date. It took just seven minutes for the Bulls to score their first goal but they will need to learn from Neath's equaliser which slipped past keeper Dan Connor possibly because the wall hadn't been properly organised. The referee gave a talking to several players after a push or three. After then it was virtually one way traffic especially towards the end when Neath were looking tired. The refreshments were excellent other than the coffee. And Trundle didn't score. Hereford United eased to victory at Gnoll Park in the early kick-off, with a 6-2 victory at Neath. United took the lead through debutant Joe Colbeck, before a quickly-taken free-kick from Kevin Cooper levelled proceedings. Sean Canham then finished well to hand Hereford a narrow advantage at the break. In the second-period, fitness shone through and Hereford added three goals through Colbeck, Canham and Stuart Fleetwood. Leon Thomas headed in a consolation for the hosts before Canham completed the scoring, with his hattrick. Simon Davey's men only had to wait seven minutes to open the scoring. The ball broke for Colbeck on the right, with the recently signed winger nicking the ball around his marker before shooting across 'keeper Craig Morris and into the far corner. Craig Hughes struck straight at Dan Connor from the edge of the area whilst at the other end, Fleetwood had two chances, with one ending up into the arms of Morris and the other finding the back of the stand. A free-kick in the middle of the park wasn't dealt with by Michael Townsend and it fell nicely to Paul Fowler, with his header from a tight angle hitting the outside of the post. Colbeck's placed left-foot shot fell yards wide before the hosts managed to get themselves back into the game. A free-kick from Cooper, some 30 yards out, was hit early and caught the United defence off-guard and beat Connor at his near-post. The 'keeper was left berating his defence who weren't organised. Cooper came close to scoring a second in a matter of minutes, with a quick-corner seeing the ball make its way to the midfielder but this time, a left-foot shot cleared the bar. As the half progressed to an end, Canham put Hereford back in front. The ball was won back mid-way in the Neath half and Kenny Lunt slotted a through ball to Canham on the left edge of the box, and the former Notts County man sent a right-foot shot around Morris and into the far corner. The second-half took a while to get going, although the hosts looked the more likely to register in the early stages. Lee Trundle tried a trademark left-foot bender towards the far corner but could only find the arms of Connor before former Swansea City youngster Chad Bond broke from the half-way line but couldn't hit the target with a long-range effort. O'Neil Thompson should have made it 3-1, when Fleetwood played him in but the Jamaican international went for power instead of placing it and smashed it over the bar. An instinctive through ball by Colbeck found Fleetwood racing through with the striker failing to hit the target at the near-post. Fleetwood then tried an overhead kick inside the area which fell a couple of feet over the bar. Neath had a couple of half-chances through Ian Hiller's header, which was off-target whilst Hughes's left-foot shot was parried away by Connor. After Fleetwood had headed a Colbeck header over the bar, the goals started to fly in, with Colbeck's second coming in the 80th minute. A pass by Mcquilkin from the left found Colbeck in acres of space and he drilled a shot into the far corner. Just one minute later, a fourth goal was scored as Thompson lifted a pass over the back-line for Canham to race onto and he fired past Morris from inside the area. Daniel Stratford replaced Colbeck, in Hereford's only sub of the day as the Bulls added a third goal in the space of five minutes. Fleetwood broke from the right, and eventually fired in off the post with a right-foot shot despite looking like he had done too much. The hosts managed to pull another goal back, after Trundle had out-skilled Janos Kovacs and a scooped cross was headed in by sub Leon Thomas under the bar. Yet, Hereford had the final say in the match as Stratford's deft touch set up Canham from 25 yards and the striker grabbed his hattrick with an excellently struck shot which found the top corner. Like so many games against lower graded opposition, fitness was the main factor and Hereford dominated the final stages, grabbing four goals in the process. The returning Thompson in his defensive midfield role was key to the victory, allowing Mcquilkin and Lunt to hold higher positions on the field. Colbeck showed some good touches on right-wing, showing a good work-rate and defensive mind, as well as taking his two goals extremely well. Mathieu Manset was missing due to injury, but hopefully will return to the line-up next weekend against Crewe; Canham, despite his three well taken goals, appears to offer little else and his strike-partner Fleetwood was visibly frustrated with him today. Around 300 fans were present at Gnoll Park; many of the Hereford fans who made the journey are likely to be at Gresty Road next Saturday, when Crewe entertain the Bulls in the opening League Two fixture. Hereford: Connor, Green, Kovacs, Townsend, Valentine, Colbeck (Stratford), Thompson, Lunt, Mcquilkin, Fleetwood, Canham. Subs not used: Bartlett, Kanoute, Weir, Rose, Gwynne, Evans, Reid, Malsom, Thomas. Neath: Morris, Cummings, Fairbourne, Cochlin, Hillier, Cooper, Hill, Fowler, Hughes, Trundle, Bond. The Bulls beat Neath 6-2 in their final pre-season match at The Gnoll. Sean Canham scored a hat-trick, with debutant Joe Colbeck scoring twice. Stuart Fleetwood bagged the other. Colbeck replaced the injured Mathieu Manset, who picked up a knock on Wednesday. The Bulls, with trialists Samba Kanoute, Zac Evans, and James Reid on the bench, made only one substitution with Colbeck being replaced by Daniel Stratford. Rochdale have signed released Bulls winger Matt Done to a six month contract that will run through to the new year. Boss Keith Hill says the club is 'still some way short of a budget that will allow us to compete in League One'. Former Bulls trialist Kayne McLaggon is expected to sign for Conference side Salisbury shortly. Alan Connell says he wants to prove he is 'too good for the Conference'. He played in Grimsby's 4-2 win over Lincoln last night, with Gavin McCallum scoring both of Lincoln's goals. The Football League are planning to allow the fourth official to inform the referee about on-pitch fouls, a pre-season meeting of managers was told this week. Port Vale have been given more time to discuss the proposed £400,000 investment into the club. Trader Mike Newton will meet fans tomorrow to discuss his plans for the club. Notts County chief Ray Trew says he has cut debts at the club from £7.3million to £2million in six months, and thinks he can make the club debt-free by the end of the year. He has taken on another £2million of debt in buying the local rugby side. Welsh referees are threatening to 'make themselves unavailable' for the first round of Welsh Premier fixtures in two weeks. They have been refused a pay rise from their current £80 a game payment, which is claimed to be the lowest in Europe. Accrington have appointed Billy Stewart as their new goalkeeper coach. He has just finished with the England u19 European Championship side. We've reached the 2004/05 season in our review of Graham Turner's time with Hereford United. Another good season on the pitch but disappointment at the play-offs. Pre-season started with the news that coach Richard O'Kelly was moving to Bournemouth. His style of football would be missed. "I've this thing about football that as a player and as a spectator I've got to be entertained because if I'm not entertained then why do it?," said O'Kelly. "Graham wished me all the best when I told him about the move to Bournemouth, even though he swore a few times when I first told him." Also moving was Ben Smith up the A49 to Shrewsbury. Later both Steve Guinan (to Cheltenham) and Michael Rose (to Yeovil) left Edgar Street. However Turner started recruiting early than usual as in early June he signed midfielder Craig Stanley who had been at Telford and later that month Adam Stansfield joined from Yeovil. John Trewick was appointed as the new coach. "He's given up a very good package at Wolves to join us," said Turner. "When you get a coach that's worked at a higher level coming to a smaller club they've got to adapt." In early July keeper Matt Baker left to move to Wrexham but better news a week later when it was revealed that Tamika Mkandawire would be returning. Graham Hyde was another new player. And just before the season proper got underway, Turner signed three more players - Lee Mills, Mark Robinson and Johnathan Gould. 3644 turned out for the first game of the new season and the Bulls defeated Farnborough 3-1. However the following Tuesday at Crawley could only draw 1-1. Meanwhile Turner reaffirmed his support for Hereford. "It's been so long since I managed a side in the League that I can't remember what it is like," he said. "But I want to taste it again. I was with this club when we went down and I want to be with Hereford go back up again." A 3-0 win at York should have restored confidence but then a 1-0 home defeat by Stevenage. "We certainly didn't play anywhere near with the sharpness with which we've been playing on our first three games," said Turner. And on September 4th another home defeat. Halifax took their revenge on the Bulls after the previous seasons 7-1 drumming by winning this game 3-2. Turner locked the team in the dressing room for over half an hour after the final whistle. However the following Saturday the Bulls bounced back and were the first team to win at Gravesend in eighteen games. Off the pitch Monday September 13th was the day when Hereford United's CVA was finally settled. "We are delighted," said Turner. "It's been a hard battle for quite some time now and required a lot of help to stabilish the finances at the club. But we've done that. "The big millstone now is that one million pounds that we owe the developers. That is the next thing we have to overcome." Late in October Turner was linked to the vacant manager's job at Shrewsbury after Jimmy Quinn had quit and keeper Craig Mawson joined the Bulls. Four wins in a row pushed the Bulls into second place but then a disappointing run saw just three points taken out of a possible eighteen. The Bulls were down to eighth. However form returned with a 4-0 win at Canvey Island on November 20th. Ten days later the Bulls defeated Blackpool in the LDV Quarter Final. And Turner was given the manager of the month award. At this time the first new project for over a decade was being started - new changing rooms. "You may have noticed that work on the dressing room extensions is progressing nicely," said Turner. "I hope that this is just the start to improving the facilities at Edgar Street, of course we are aware of some of the antiquated structures inside the ground. The toilet facilities are in desperate need of replacing, but there are a number of other problems to be considered." By Christmas the Bulls were in third place but three defeats in January pushed them down to eighth. One of those defeats was against Burton. "There's no excuses for today's defeat. I thought we didn't work hard enough, it's as simple as that," said Turner. "Seven or eight of our players needed a kick up the backside to get started." On January 15th The Bulls played Accrington in a Trophy tie and won 4-0 winners. They lost to Dagenham 1-0 the following Saturday and had dropped to eighth place but then started a run of 16 League games with just one defeat. The Dagenham game was the 500th with Turner in charge. He had won 205, drawn 124 and lost 172 in all games. The goal talley was 732 for and 612 against. As the season continued the Bulls were facing fixture congestion. Runs in the LDV Trophy, the FA Trophy and the GLS Cup had meant that several League games had to be postponed. It didn't help that it took a replay to defeat Eastwood in the Trophy and then in another reply the Bulls were defeated by Hucknall Town. Meanwhile Turner was put up for a FourFourTwo FQ award. Without people like Graham Turner there wouldn't be football clubs. The Hereford Chairman and Manager has almost single-handedly kept the club afloat during many a stormy season. For his investment in his community, perseverance and loyalty we salute Turner's FQ. Let's hope we welcome him back to the Football League this summer. More good news was the revelation that Hereford United had made a profit of £298,585 to the year ended May 31st 2004. Turner took the opportunity to spell out his plans for the club. "We have got to bring the ground up to a standard where it is acceptable to our supporters," he said. "Toilet blocks, canteen facilities. turnstiles, even the terraces themselves, all those have got to be done at the two ends, the Meadow End and the Blackfriars End and they've got to be done fairly rapidly. "We want an extension to the leases and we want to start putting plans in place to get the two ends done. "What we've got is a situation where we owe a million pounds to the developers and we want be able to get away from that. So what we hope to incorporate something that will suit them and at the same time get the ends developed. And if its office space, if it's a cinema, if it's residential that's fine. They can make some money out of that. "From our point of view if we can get the two ends refurbished with good facilities for supporters, and we can somehow incorporate the million pound debt into it, good." Striker David Brown left the club and joined Accrington. "We bent over backwards to allow David to go to college two days a week," said Turner. "He was told to train with us on Wednesday, the day after the Eastwood game, bearing in mind he would not have been in on Thursday. A defeat at Morecambe on March 22nd stalled the Bulls promotion run but it was soon back on track with a 6-0 away win at Farnborough even after Leroy Williams was sent off. The following Monday saw Danny Carey-Bertram sent off in the 4-0 victory over Northwich. "We had Leroy Williams sent off at Farnborough on Friday and now Carey-Bertram which is absolutely crazy," said Turner. "It could be put down to the impetuosity of youth but there is no excuse for what he did today." By the beginning of April a play-off spot looked likely. A win at Stevenage and then a draw at home against Carlisle lifted the Bulls to third place but only on goal average. "Carlisle are a decent side," said Turner. "They will not be far off at the end of the season and I don't think we will be either. "It's been terrific. Three straight wins, four matches now without conceding a goal. Eleven goals in three matches." More wins followed. Firstly 2-0 against York, then 3-1 at Forest Green, and 1-0 at Halifax. However the last two games were drawn. The Bulls finished in second place, 12 points behind Barnet. The play-offs followed but promotion was not to be. The first leg was at Stevenage and was drawn 1-1. Danny Carey-Bertram put the Bulls ahead in the second half but 12 minutes later Dino Maamria equalised. 1400 supporters sang their hearts out in support of Hereford. "The atmosphere at Stevenage was terrific and there is no doubt that the fans can play a big part in the way we perform," commented Turner. The second leg was on Thursday May 3rd. 6862 packed Edgar Street but it was heartbreak when Dino Maamria put Stevenage ahead and the Bulls just couldn't find an equaliser. Des Kelly, one of Britain's best-known sports columnists and now patron of the England Blind Football Squad, hosts a celebratory football chat show at Hereford's Courtyard on Wednesday August 18th at 7.30pm. Special guests include football legend Sir Trevor Brooking and goalkeeping giant Ray Clemence, MBE. Des will take a walk down memory lane looking at Sir Trevor’s 17 years at West Ham and his time under England managers Sir Alf Ramsey, Joe Mercer, Don Revie and Ron Greenwood. He’ll also be discussing with his guests the state of play in football following South Africa’s World Cup, and look at why events like the Blind World Cup are so important for the growth of the beautiful game in this country. The evening is a must for all football fans, and is programmed to mark and celebrate the Blind World Cup which The FA are hosting at The Royal National College for the Blind’s thePoint4 during this week. VIP tickets £35, offer the opportunity to enjoy a drinks reception after the show with Des Kelly, Sir Trevor Brooking and Ray Clemence. Other tickets £18, concessions £12. Meanwhile another event at the Courtyard, on August 16th at 11am, will feature The Rural Media Group and their Same but Different project which looks at equality and diversity in Herefordshire. A special documentary by the Shoot Out team captures the preparations for this summer’s Blind World Cup in Hereford, and the legacy it will leave. This is a brilliant opportunity to see the work in progress, and to discuss equality, diversity, and sport (and the media’s role in it), not only in the week The FA hosts the Blind World Cup in Hereford, but as we start to count down to the London 2012 Paralympics and Olympics. Entry is just £2 and the audience will each receive a free pass to one of the World Cup games at The Royal National College for the Blind’s thePoint4. Former Hereford United manager Graham Turner has said that he hopes he can have the same sort of success he achieved at Shrewsbury in his first stint as manager. "The expectations now I'm back, after what happened 30 years or so ago, will be very high," said Turner in an FL interview. "We've got to manage those expectations, but the ambition is to be in the promotion race and the club feels it could support itself if we get to League 1. "The dual role was becoming increasingly difficult at Hereford," he said. "I was proud of the record we had, trading in the black for seven consecutive seasons and getting a couple of promotions in that time, but the time came when I just want to have a go somewhere else before I retired and just as a Manager. "I was delighted to get the opportunity at Shrewsbury and I've settled in very quickly. We needed a big change-around in personnel because there weren't too many players left at the club, so we've brought six in so far and hopefully there'll be another two or three coming in before the start of the season. "Pre-season's been going well and I've been pleased with the response from the players. We're changing the style a bit, getting the ball down and passing it, and the players have taken to it well. We'll make some mistakes, but it's coming on and I'm feeling very optimistic for the season." Just a couple of reminders for those fans planning their trip to Crewe on the 7th August. HUISA coaches depart from outside Radford's at 10.00 am with a fare of £16 (HUISA members £14). Seats can be reserved through the Club office (08442 761939). TRAINS leave Hereford for Crewe at five minutes to every hour. The most economical way is to buy in groups of between 3 and 9 people. You need to buy a day return to Leominster and a "Small Group Day" return from Leominster to Crewe. Both tickets can be purchased at Hereford before boarding the train and there is no need to get off and back on again in Lemner. The cost per adult is £17.80 in total. A full travel and alehouse guide will be published later next week. Tickets for the first League game of the season, away at Crewe on Saturday August 7th, are now available from Hereford United. They can be purchased in person, by phone or by post. Whilst these prices are the same as at Crewe on the day, Hereford United advise supporters to purchase from Edgar Street to avoid any delay at Gresty Road. However Crewe do offer 'members' tickets at somewhat less cost - for example an adult ticket for £16. They also offer a 'family' ticket at £16 which allows one adult and a child under 11 into the ground. Students can watch for just £8.50 provided they have a Crewe student membership card. The Bulls are one of 16 sides to get a bye in the first round of the Johnstones Paint Trophy. The Bulls are again in the Southern section, with Cheltenham and Carling Cup opponents Colchester also receiving byes. Shrewsbury are grouped in the Northern section and will have to face another remote football outpost in the First Round. Former Bulls loanee Mark Marshall will sign for Barnet tomorrow before their friendly with Peterboro. He is understood to have agreed a one year deal after being released by Swindon. Tony Capaldi has opted to join Crystal Palace over Plymouth. Simon Travis is reported to have left Jon Brady's Brackley Town. Mark Beesley has agreed a contract with big-spending Fleetwood after a trial spell. He joins an experienced Conference front line that includes former Bulls tormentors Wayne Curtis and Magno Silva Viera. Wycombe physio Shay Connolly has left the club to move abroad. Port Vale say they want more time than today's deadline to discuss a proposed £400,000 investment. Crewe have signed Polish keeper Bartek Fogler on a six month deal. The 25 year old turned down a contract with Legia Warsaw to move to England with his girlfriend. Steve Guinan is unlikely to be offloaded by Northampton after scoring four goals in pre-season. Manager Ian Sampson says that he will 'think twice' after being impressed by Guinan's pre-season contribution. Southend have released French pair Francis Laurent and Jean-Francois Christophe by mutual consent. The Shrimpers also say they have agreed a fee with Charlton for defender Simon Francis, who was released last month but the club retained his registration. The moves mean they have just five players under contract, with one of those having also asked to leave. Notts County are to take over tennants Nottingham Rugby. Magpies chairman Ray Trew healed the rift between the two that opened up when Munto Finance kicked the rugby side out of Meadow Lane, and has now opted to buy the ailing side outright. Bradford have signed Stoke striker Louis Moult on a three month loan. The 17 year old has made three sub appearances for the Potters, and top scored for both their u18 and reserve sides last season. Bradford have also signed defender Lewis Hunt on a one year deal. The former Wycombe defender was released by the Chairboys in May. Aldershot have signed former Chesterfield winger Wade Small, non-league winger Jermaine McGlashan, ex-Cardiff full back Aaron Morris, and non-league defender Clayton Fortune, all on one year deals. Hyde have denied they are being bankrolled by Man City after the Eastlands club agreed to use Hyde's ground as the base for their reserve side. Since the move, Hyde have dropped the United from their name, and changed their red kit for a blue one. Their ground has also been repainted blue, and the pitch has had thousands spent on it by City. Not before time Edgar Street is slowly being transformed to bring it into the 21st century. The promise of a new stand at the Blackfriars End and, in due course, the Meadow End as well will provide much needed better facilities. More urgently Chairman David Keyte has promised that money will be spent on refurbising the toilets which really do belong to a by-gone age. However one of the first tasks is to provide new dug-outs. Work has started on these and they will be ready for the first home game of the season on August 10th. The dug-outs being replaced were not up to League standard. Meanwhile several advertising boards around the ground have been taken down in readiness for new boards which will also be in place by August 10th. Hereford United have asked supporters to join them in an Edgar Street Ground Watch System. This follows an incident after Wednesday's friendly against Plymouth Argyle when their team coach was leaving the ground. "This seems to be a random act, and the culprit most probably has no connection with Hereford United but we want to make sure this sort of thing doesn't happen again," said Bulls vice-chairman Tim Russon. "Every right minded citizen of Hereford wants visitors to be given the warmest of welcomes. "We'd like our fans to help keep watch us as they come and go from the ground not just on match day but at any time and report anything suspicious to the police. Hopefully this was an isolated incident and the Plymouth team the unfortunate victim. It could easily have been a passing car on its way into or out of town. "Two or three thousand extra pair of eyes will help keep the streets of Hereford peaceful." Russon said the club would employ extra stewards outside the ground following the incident which occured at the junction of Blackfriars Street and the A49. The Bulls play the last of their scheduled pre-season matches at The Gnoll on Saturday in a 11.45 am kick-off. Neath are known as The Eagles and share their home at The Gnoll with South Wales Scorpions RLFC. The present club have been in existence since 2005 following a merger of Skewen Athletic and the old Neath FC. Leave Hereford via Belmont Road and take the A465 to Abergavenny. At the roundabout, follow signs for Merthyr Tydfil. Continue along the A465 (Heads of The Valley Road) passing Ebbw Vale, Tredegar and Merthyr. Then following signs for Neath, continue on the A465 through Glyn Neath. There is a roundabout at the junction with the A474 where you should take the 1st exit (sign Neath) then at the next roundabout take the 2nd exit and at the next, the 1st exit onto Eastland Road (B4434 – sign Cimla). This road (B4434) will take you directly to The Gnoll which will be on your left as you approach. Distance from Hereford is about 66 miles and you should allow an hour and a half. Postcode is SA11 3NA. If you are planning to arrive via the M4, you should leave at junction 43 and follow the A465 into the town. At the roundabout, follow signs for Cimla and Pontrhydyfen. At the traffic lights, go straight ahead until you reach the second roundabout. The Gnoll is directly ahead. Admission is understood to be £7 for adults and £5 for concessions. Joe Colbeck has signed for Hereford United on a two year deal. 23 year old Colbeck is a right winger formerly with Oldham Athletic. He joins the Bulls on a free transfer. "Joe is just the ideal attacking winger we've been looking for throughout pre-season and I think he is the final piece in the jigsaw " said Hereford United manager Simon Davey. Born 29th November 1986, Colbeck joined his hometown club, Bradford City, as a youth team player in 2002, making his debut two years later. He played more than 100 league games for Bradford, and won the club's player of the season award during the 2007–08 campaign. He joined Oldham Athletic on transfer deadline day in September 2009, rejoining manager Dave Penney, for whom he previously played during a six-game loan spell at Darlington. He was transferred listed by Oldham earlier this month. Whilst with Bradford he played against the Bulls twice in the 2007/08 season. His signing brings the number in the squad to 18 which doesn't include Samba Kanoute who is still expected to sign making 19. Whether Davey will confirm the signing of one of the young trialists who featured late in the game last night against Plymouth remains to be seen. Davey recently said he wanted a squad of 20. Former Hereford United player Frank McGrellis is to become a regular broadcaster on Australian radio. He will be one of a team discussing the latest developments in Victorian State Soccer from their Melbourne Studios. Frank is an ex-professional footballer from Banknock near Falkirk who started with Coventry City straight out of school and eventually moved onto Hereford United before deciding to head to South Africa where he signed for Highlands Park and Wits University. Then he took the step to Australian in 1987 where he signed for Brunswick Juventus before taking up coaching. He joined Hereford United towards the end of the 78/79 season from Coventry and during a four year stay at Edgar Street made 85 league appearances for the Bulls scoring 24 goals. His first goal came after just eight minutes on his debut for the Bulls in a game against Scunthorpe on April 7th 1979. He also scored in his next two games, away at Newport County and at home against Stockport. It appears that Shrewsbury Town haven't, as yet, done a deal with Huddersfield over the transfer of former Bull Lionel Ainsworth. "Given his track record with Graham Turner, it’s more likely than not he will go to Shrewsbury if a deal on finances can be done," chief executive Nigel Clibbens told the Huddersfield Examiner. "Personal terms for Lionel would then have to be resolved." Shrewsbury have signed released Sheff Weds midfielder Sean McAllister on a two year deal. The 22 year old made only one start for the Owls last term, and had been on trial with Yeovil. Gillingham have signed lumpy striker Adebayo Akinfenwa on a one year deal. He left Northampton after turning down a new deal, and Southend couldn't afford his demands. The Gills are no longer interested in Aldershot man Marvin Morgan as a result. Bradford boss Peter Taylor has identified a loan striker he wants to add to his squad after a string of trialists failed to impress. Southend are trialling Peterboro midfielder Josh Simpson with a view to a loan move. He was one of eight trialists to play for the Shrimpers in their match with Rushden last night. Stockport are to sign Plymouth striker George Donnelly on loan until January. He played 19 times for the Hatters on loan last season, scoring four times. Macclesfield have signed teenage keeper Jack Cudworth on a one year deal. He ended last season with Rhyl, but left when they were relegated after failing to secure admission to the revamped Premier League. Cudworth will act as no.2 to former Bulls keeper Jose Veiga. Shrewsbury have signed former Doncaster keeper Ben Smith on a two year deal. The 23 year old played four times for the Championship side last season, and three times for Morecambe on loan. Torquay have confirmed the signing of striker Martin Gritton from Chesterfield on a six month loan. Cheltenham boss Mark Yates says he will bring in another striker before the start of the new season. HUISA have arranged their AGM for Saturday August 14th at 12.30pm. The meeting, to be held at the Richmond Club, is before the Gillingham home match. New members are welcome to attend. HUISA will be offering standard membership for £15, and a new concession membership at £10 for under 16's and over 60's. Winger at Edgar Street Today. Hereford United manager Simon Davey has confirmed that a winger will be at Edgar Street today. It's appears he will be a signing as opposed to a trialist. In other news from the post match press conference, Davey said that Samba Kanoute will be signing a deal in the next few days. O'Neil Thompson, who was missing last night, would be back soon. Davey said he had decided who would be captain but hadn't told the player as yet so wouldn't be telling the press either. "I'm pleased. Fitness levels are looking good. The players are working very very hard. They are starting to gel a little bit more as a unit. We are looking forward to Crewe." After last night's football friendly against Plymouth, Hereford United turn their hand to golf today at Belmont, back to football on Saturday at Neath, and then a cricket match at Eastnor on Sunday. Of course not many of the current players will be involved with either the golf or cricket, however several of the staff will be taking part. The golf tournament, known as the Hereford United golf day, takes place this morning at Belmont Golf Club. The cricket match is to raise funds for the Charles Renton Unit at Hereford Hospital. It will start at 2pm at Eastnor's Clenchers Mill Lane. The 'Bulls' team will be managed by former manager Colin Addison and, according to the Hereford Times, could include Gary Stevens, Ian Rodgerson, Dudley Tyler, Billy Tucker, Jamie Pitman, Mel Pejic, John Layton, Steve Emery and Kevin Rose. Nearly twice as many Hereford United supporters have watched the pre-season friendlies at Edgar Street compared with last year. Whilst it is often difficult to compare like with like because of the perceived quality of the opposition, there's little doubt that the new 'regime' heading Hereford United has kindled some extra interest in the club. Plymouth Argyle came away from Edgar Street this evening with a narrow victory, courtesy of a solitary Steve Maclean header. The former Glasgow Rangers striker followed up a shot from Onismor Bhasera effort to see Plymouth supporters return to Devon content. Another decent attendance was present, with 127 away followers in the overall figure of 1343. United were without O'Neil Thompson for the game but otherwise were at full strength. The first-half was a dour affair with little entertainment offered at either end. A cross from the right came through to Anton Peterlin but his scuffed effort was saved by Adam Bartlett. Soon after, a ball through the middle wasn't dealt with by Michael Townsend, under pressure, but Rory Patterson failed to lift the ball over Bartlett. Kenny Lunt's patience down the left eventually saw him pick out James Mcquilkin on the edge of the area and his crisp drive fell inches past the post. A snapshop volley inside the box from Patterson was held by Bartlett, and the former Kidderminster 'keeper was on hand to deny Yannick Bosale with a right-foot drive. Simon Davey opted to keep the same side for the second-half apart from introducing Dan Connor for Bartlett, but his counterpart Peter Reid opted for five changes, and these were intstrumental in helping Plymouth take the lead. Maclean sent a warning to Connor with a downward header that the Irishman saved with his feet, but on the 59th minute, the Scottish striker made no mistake. Bhasera skipped in from the left, avoiding a number of tackles before sending a fierce shot goalwards; Connor got a strong hand to it but the ball fell nicely for Maclean to nod into the net. The encounter became a little fiesty, with some late tackles and flying elbows causing a few players to get a little heated. In the midst of it all, Kovacs powerful header from a Lunt free-kick was pushed over by Plymouth 'keeper Colin Doyle, although the referee opted to award a goal kick. The subs started to roll on then, with eight changes in total being made by the home team. Mcquilkin failed to hit the target with a left-foot shot from 25 yards as the subs continued to flow and disrupt any sort of rhythm the game had picked up. With just over ten minutes remaining, Hereford had perhaps their best chance to equalise when a Lunt free-kick picked out the unmarked Sean Canham but he failed to connect with a header from six yards. It was a tough work-out against Plymouth, who played some neat, quick football. Without wanting to state the obvious, United lacked width. Too often, long balls were pumped up to Canham and Manset, a far cry from the fast attacking football we have been promised. With only ten days remaining till the big kick off, two wingers are desperately needed. The missing presence of Thompson in the middle of the park was also an important factor in the final score. Next up is Hereford's final friendly, when they visit Neath on Saturday. Hereford: Bartlett (Connor), Green (Stratford), Kovacs (Rose), Townsend, Valentine (Weir), Mcquilkin, Lunt (Evans), Gwynne (Kanoute), Canham (Reid), Fleetwood (Thomas), Manset (Malsom). Subs not used (Apparently, although I didn't see him warming up...): Ani. Plymouth: Doyle, Seip (Timar), N'Gala, Arnason (Paterson), Bhasera, Clark (Molyneux), Peterlin, Johnson (Summerfield), Bolasie (Wright-Phillips), Patterson (Noone), Fallon (Maclean). There were two new trialists on show tonight, almost. New names were on the team sheet in James Reid and Jeremiah Ani. Reid is a former Nottm Forest winger who ended last season with Lincoln, and is an England youth international. Jeremiah Ani was, two years ago, at trialist at Edgar Street as Jerry Ani. He has more recently been on trial at Notts County after spending time in China, Finland, and Portugal since his last spell here. He, however, did not make it onto the pitch. Other trialists on show were Zac Evans, Aidan Thomas, and Samba Kanoute. There will be full commentary of this evening's friendly between Hereford United and Plymouth Argyle on Bulls Player. Keith Hall from BBC Hereford and Worcester will be behind the microphone, as the regular commentators are unavailable. Commentary will also be available from the Plymouth Site. Hereford United manager Simon Davey has said that promotion is his aim. "There's a new Chairman and a new board and now I'm their new Manager, their first appointment," Davey told www.football-league.co.uk. "Things are looking up at the club. We're quite ambitious, I'm ambitious, I want to get to the top again and so does the Chairman. We match each other's ambitions and it seemed to be the right recipe for the pair of us to link up. I am really looking forward to the challenge. "The expectations at the club are for them to do better than they have done in recent seasons, and for me personally I'd love to get promoted straight away on our first go but realistically I've got a two-year contract and at the end of the two year period I'd like to be in League 1 with Hereford." "I only inherited seven players so the biggest process was the recruitment policy. We had to bring players in and at the end of last week we had 15 under contract, which is good going from where we started. "It has been a slow close-season. You speak to other Managers and agents and they saying no-one is moving. There are lots of players out of contract and lots of players shopping around for the best deal. They won't make a decision until they aren't getting paid, that happens at the end of June and July is the time that everything starts to move. "We have managed to get hold of eight new players which I'm pleased with and hopefully there is another five or six to come." Marc Pugh has been given the no.7 shirt by Bournemouth for the coming season. Bradford have banned four people for life, and 20 more for the season, after a pitch invasion following their final home game of the season in May. 16 more people have agreed good behaviour contracts, and other people are still being sought. Steve Guinan has kept the no.9 shirt at Northampton despite being on the transfer list. Barnet have confirmed the signing of striker Steve Kabba and the resigining of defender Daniel Leach. Matt Done remains on trial with Rochdale and was joined last night by former Bulls trialist Jamie Sheldon as the Spotland outfit lost 3-0 to Bury. Chesterfield have signed 19 year old utility man Jack Hunt on loan from Huddersfield until January. Also leaving the Terriers is teenage defender Lee Franks, who has joined Oxford until the new year. Mansfield have announced a £500,000 loss for the 08/09 season, their first after relegation. The accounts report that they paid former owner Keith Haslam around £3,000 a week rent on the Field Mill stadium. Crawley say they expect the winding up order against them to be thrown out as they paid the debt over a month ago. Carlisle have relaunched their matchday programme as a slimmed-down 16 page version for £1 instead of the 64 page version for £3, and will put the missing additional features into a new bi-monthly magazine. They say falling sales have prompted the new venture. Stockport boss Paul Simpson says his season will be successful if the club remains in League Two: "Come the end of the season, we must still be involved in League Two as an absolute minimum. If we do that, it will have been a successful takeover and a successful season." Rushden have had their winding up order thrown out after they paid off the taxman. Dorchester have been given three months to settle their historic debt with the taxman, while Ilkeston have been given six weeks to settle their debt. Mathieu Manset is 100/1 to be the division's top scorer this season. Several more bookies have released odds overnight to include the other Bulls forwards. Manset is 100/1 with Corals, with Sean Canham also available at that price. Stuart Fleetwood is 40/1 with BlueSq and Ladbrokes but remains as low as 16/1 with Skybet. A number of ex-Bulls are also listed. Steve Guinan is 50/1 alongside Lewis Young. Tim Sills is 80/1 and Gavin McCallum 100/1. Cheltenham's strike duo of Jeff Goulding and Wesley Thomas are 100/1 and 150/1 respectively, while Shrewsbury's best hope according to the bookies is 66/1 shot Matt Harrold, with their other forwards all 100/1 or higher. Adam Le Fondre is 7/1 favourite, with 14/1 Phil Jevons second in the list. In League One Theo Robinson is 33/1, and Adam Stansfield and Joe Anyinsah are both 80/1. Rickie Lambert is 5/1 favourite, with Aaron MacLean and Lee Barnard 12/1. In the Conference ex-Bulls Nick Chadwick and Lee Morris are 40/1 and 100/1 respectively to be top scorer. Favourite is Matt Tubbs at 8/1, with Richard Brodie and Tom Craddock 9/1. The last home friendly takes place this evening at Edgar Street where Plymouth Argyle will be the visitors. Hereford United manager Simon Davey will be expected to put out his strongest side against the League One side who could include former Bull Tony Capaldi in their squad. It's thought that Davey may have a trialist in his line-up, probably a winger. "We are still in the building process getting match fitness but it’s another game along the way," said Davey as reported by the Worcester News. "We are making sure the players are gelling together, understand their roles and what I expect of them. "We are trying to bed a system in and get the players used to each other." As well as Capaldi another player who has been on the books of both clubs is Sam Malsom. He was released by Argyle in spring 2007 despite a good scoring record in their youth sides. Kick-off is at 7.45pm and admission costs £8 for adults, £4 for concessions and £1 for the under 16's. Meanwhile former young Bull Joel Edwards who was released by Graham Turner in May has joined Westfields. This is a reminder to anyone who wants to enter the warm up round of the Bulls News Prediction League that you have until 7.45pm this evening to get your predictions in for the home match against Plymouth Argyle. To enter, send in your final score and attendance predictions to bullsnewspredictions@hotmail.co.uk . Remember to include your chosen username for the season. Lionel Ainsworth hopes he can re-kindle the form he found at Edgar Street when Graham Turner was in charge and that was the main reason he has chosen to join Shrewsbury as opposed to Hereford United. Bulls manager Simon Davey gave details at the fans forum last night. "We offered him everything he wanted but the problem was a man called Graham Turner. "I had a text 10 minutes ago from Lee Clark to say he was to sign for Shrewsbury." Davey would have liked to bring Ainsworth to Hereford but understood his reasons for going elsewhere. "Turner is the only manager under whom he has been successful." Ainsworth has failed to shine at Huddersfield on the field and off the field problems involving his family probably haven't helped. He was arrested in March 2009 and charged with affray. His cousin Lian Munn had been murdered seven weeks earlier. However Police dropped charges last November. The third Hereford United Fans Forum of the season took place this evening near Ledbury. Ainsworth - Hereford United offered him everything he wanted but he has decided to join Shrewsbury. Manager Simon Davey said that he had a text from Lee Clark, Huddersfield manager, confirming this. On trial Samba Kanoute - Davey said he has potential, sees him as back up but could flourish. He will sign a contract. Leases - Still in talks with the Richardsons. They no longer want to be attached to the club so Tim Russon said hopefully a deal will be done in the next 2-3 weeks. Just in talks over the exact figure to buy out the leases. "The Chairman, David Keyte, and I have been working on a deal for the last month and the aim is to give Hereford a big future at Edgar Street. It’s vital we do things right and make sure the plans we put in place now will benefit the club and the community for many, many years to come," explained Russon. New winger - Medical Thursday, the player is at a club but no fee will be paid. He was signed for a fee though. Davey said this player would make an impact on the starting 11. Centre of excellence - Meeting next Tuesday to apply for the licence. Goalkeeping coach - Job has been offered to an un-named person. Chief scout - Club has employed a chief scout who worked with Davey at Barnsley. Groundsman - Looking into the option of a full time groundsman being employed. Around 30 people are believed to have been present at the Eastnor venue. The steady stream of clubs facing winding up orders keeps on flowing with four more facing the court tomorrow. The surprising, or not so depending on your take, name of the four is Crawley Town. The free spending Conference second-favourites are claimed to have only found out about the winding up order this afternoon when details of the date were posting on the ctfc.net forum. They say they are investigating the claim. Also in the dock tomorrow are fellow Conference side Rushden, a regular visitor over the past few seasons. They have struggled to run on an even keel since Max Griggs handed the club to supporters five years ago. The other two, both facing the taxman, are Conf North Ilkeston and Conf South Dorchester. Dorchester, who were abandoned last summer by current Bournemouth chairman Eddie Mitchell, say there are in a far better position than they were when he left and are meeting their day-to-day obligations, but are struggling to meet their historical debt. Plymouth Argyle supporters will be able to quench their thrist in Hereford United's Radfords Bar before tomorrow's evening friendly. In other club news, the Community Trust is looking for a young person between 16 and 18 to become an apprentice football coach. More details on the OS. New Football League rules come into force this season limiting squads to 25 players over the age of 21. Ten of those 25 must be classed as home grown, which means they must have been registered in either England or Wales for three seasons before their 21st birthday. With the Bulls squad unlikely to reach 25, and short term loans are not covered by the rule anyway, the Bulls have little chance of breaking the rules. On the home grown front, the current squad has only four players - Manset, Kovacs, Thompson, and Connor - that can't be described as home grown, with Manset not affected by the rules as he is under 21. Corals have priced the Bulls at 5/1 to finish in the top seven this season. Bookies favourites Wycombe, Gillingham, Rotherham, and Bradford are all odds-on in the list, with Barnet the 12/1 outsiders. Shrewsbury are a less than certain 5/2, with Cheltenham 8/1. Simon Davey is 10/1 to be named the first Manager of the Month in a list produced by Victor Chandler. Stevenage's Graham Westley is 9/1 favourite, with Shrewsbury, Gillingham and Stockport also on 10/1. Crewe's Dario Gradi is the 16/1 outsider. On the winners list Gillingham are down to single figures across the board, with 9/1 now the best price on Andy Hessenthaler's men. Gary Hooper has completed his £2.4million transfer to Celtic, earning Southend £445,000 in the process. Morecambe are to sign Wrexham defender Andy Fleming on a two year deal. The fee is likely to go to a tribunal for the England C man. The Shrimps have also signed Northampton defender Chris McCready, also on a two year deal, after he was transfer listed by the Cobblers. Shrewsbury have named recent signing Ian Sharps as their captain for the coming season. Accrington have agreed deals with striker Rory Boulding and full back Jon Bateson. The one year contract will be completed when their embargo is lifted. Wycombe have named veteran Gareth Ainsworth as their new skipper, while their England u19 man Matt Phillips is generating interest from several Championship clubs. The Chairboys have also agreed a fee with Wealdstone for former Bulls full back Marvin McCoy. Former Bulls loanee Tony Capaldi is reported to be missing from Plymouth's training this week, but the player and club are still in talks. He is to play in a trial match with Crystal Palace. Defenders Lee Molyneux and Stephane Kubar have joined the Pilgrims on trial and may play at Edgar Street. Anthony Elding is expected to sign for Rochdale in the next few days. He is returning to England from Hungarian football after his family failed to settle. The Hereford United Official Site announced the signing of a goalkeeper on a season long loan deal from Chester City as The Bulls prepared for what was to be their promotion winning season from The Conference. Wayne Brown had already won 6 Caps with what is now known as the England C team. Seems that 27th July is a good day for signing players. With just over a week to go until the Daffodil Derby, the first group of competing Football League mascots at the event at Southwell Racecourse has been announced. Currently, 22 Football League mascots - plus Daffy the Daffodil - have signed up to the race on Tuesday 3 August which has been designed to launch the fundraising for Marie Curie Cancer Care - the Official Charity Partner of The Football League for the 2010/11 season. Starting at 7.45pm and forming part of the evening's racing schedule, prizes for the derby include a Day for Two with the Red Arrows and a year's subscription to World Soccer magazine. There will also be prizes for the Mascot who can raise the most money for Marie Curie Cancer Care on the JustGiving website at www.justgiving.com/footballleague2010-11, with every £20 raised paying for an hour's nursing care for terminally ill people. Both football and racing fans and their families are being encouraged to attend the racing and the evening's entertainment which sees five piece band 'Urban Intro' playing live in the grandstand. For information on tickets in exchange for a donation to the charity, please contact David Hamilton, Corporate Fundraiser for Marie Curie Cancer Care, on 0207 599 7312 or email david.hamilton@mariecurie.org.uk. Lincoln are reporting that they have agreed a fee with the Bulls for winger Gavin McCallum. Their official site reports the fee as 'undisclosed'. At the fans forum in Radfords, Bulls chief David Keyte said he'd be surprised if we got £5,000 for a player that was 'just making his way'. Meanwhile no fee has yet been agreed for Marc Pugh who has left Edgar Street for Bournemouth. Keyte told the same fans forum that they had offered £35,000 for the winger. However that wasn't enough and the final amount will be decided at a tribunal. Admission prices for Saturday's friendly at Neath have been announced. Adults will pay £7 and Concessions £5. The game is due to start at 11.45am. Charlton have made around 30 people redundant after a staff consultation. The club say they have saved four of the jobs at risk, but the remainder will leave after talks. Port Vale will offer midfielder Gary Roberts a short term deal as he continues his rehabilitation from drink and gambling problems. Lincoln were beaten 4-1 by a second-string Celtic side at the weekend. Macclesfield have launched a public consultation on a proposed new stadium. The club have proposed a 7,000 capacity stadium on a landfill site, using the methane from the rubbish underground to provide power to the site. Doubts have been raised over Mansfield's financial situation after former midfielder Andy Burgess told the press 'I didn't get paid correctly or on time once in six months'. Burgess has opted to drop three divisions and join the reformed Chester side. Gillingham will travel to Edgar Street on August 14th without striker Dennis Oli after he was diagnosed with a torn hamstring. Midfielder Barry Fuller is also doubtful for the game with a knee injury, while two more players aren't fit yet from injuries picked up last season. The Gills have denied press claims saying they have offered £200,000 for Aldershot striker Marvin Morgan. Bradford striker Gavin Grant has been jailed for a minimum of 25 years after being convicted of murder. Wycombe are pressing forward with plans for a new stadium to incorporate themselves and rugby side Wasps despite their Supporters Trust questioning the need for a new site to replace their 20 year old Adams Park stadium. The Chairboys average only around half the stadium's 10,000 capacity but the clubs are planning a 20,000 capacity ground on one of 18 sites identified by the local council. Oldham have handed Rob Purdie their no. 10 shirt for the coming season despite him being on the transfer list. The Latics say they have received enquiries for several of the six players transfer listed this month, but have had no firm offers. Southend have spoken to former Northampton forward Adebayo Akinfenwa, but say they cannot afford his financial demands. The Shrimpers face court next Monday to prove they are not insolvent. Macclesfield have signed released Notts County midfielder Matt Hamshaw on a one year deal. The 28 year old has also played for Stockport, Mansfield, and Sheff Weds. Bradford have cancelled the contract of 20 year old midfielder James O'Brien by mutual consent. The former Birmingham trainee has decided to return to Ireland. Barnet have made offers to striker Steve Kabba and former Bulls loanee Mark Marshall. They will also resign Daniel Leach after a medical tomorrow after he was released by Paul Fairclough at the end of last season. Gillingham have signed former Ebbsfleet keeper Lance Cronin on a one year deal with the option for a second season. The 24 year old has around 200 games at Conference level, but has only one League appearance to his name. Samba Kanoute may agree a deal to sign for Hereford United today. The young French defender has had talks about a contract with manager Simon Davey and was in the photo-shoot at the Open Day last Saturday. Meanwhile no more news about any possible deal to bring Lionel Ainsworth back to Edgar Street has emerged over the weekend. Chairman David Keyte said on Saturday that the chances 'may be 50/50'. Even if a deal is agreed between Huddersfield and Hereford, Ainsworth would have the final say. No doubt he would have to take a pay cut but the prospect of regular football may persuade him to consider a move. Manager Davey would, no doubt, like to know about Ainsworth one way or the other as soon as possible. The squad is still short of wingers if a 4-4-2 system is to be used. With the last but one friendly next Wednesday, Davey is expected to want to test his 'first team' against higher graded opposition. Neath next Saturday, even with Lee Trundle, aren't expected to be quite the same challenge as Plymouth. Our very own Prediction League gets under way this coming Wednesday when Plymouth are the visitors to Edgar Street. All you need to do to enter is send your final score and attendance predictions to bullsnewspredictions@hotmail.co.uk. Please include your chosen username for the season (no rude ones!). You have until 7.45pm on Wednesday to get your predictions in. Please note that this match is only a test, and the points gained will not contribute to your season total. Will Keyte bring back the Bull and the Swede? One of the promises of new chairman David Keyte is to reconnect Hereford United with Herefordshire and beyond. But will he go as far as bringing back the old tradition often practiced on FA Cup matchdays of parading a bull around the ground and dribbling a swede into goal? Back in December 2004 former chairman Graham Turner decided that messing around with swedes had no place in today's game at Edgar Street although he seemed happy to see a bull paraded. 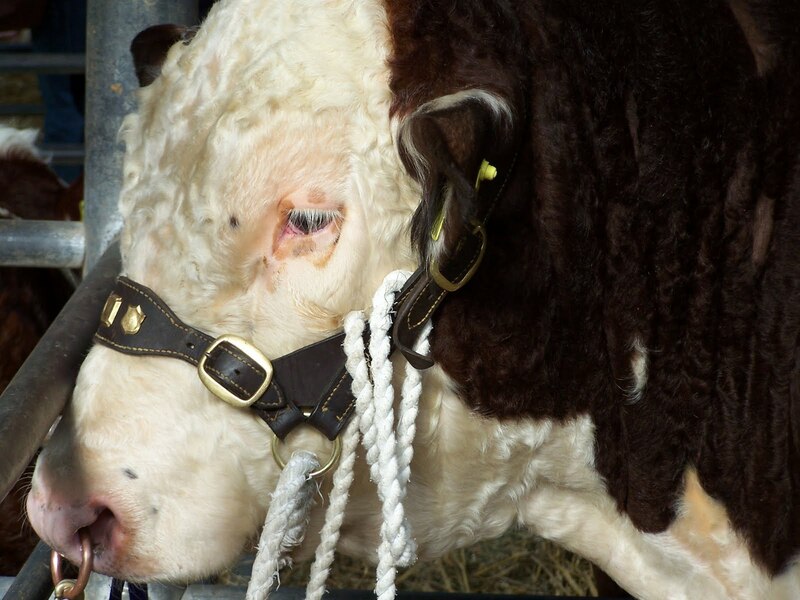 "One tradition I enjoy is the parading of the Herefordshire Bull," said Turner. "These are magnificent creatures but, unfortunately, today's match coincides with the big Smithfield Show, therefore there wasn't a trained bull, that is one used to parade rings available." Let this result be a warning to all those tempted to skimp on their vegetables: Hereford United 2, Boston United 3. Admirable though it is for Hereford to kick the swede-worshipping habit that traditionally accompanied FA Cup days at Edgar Street -"We decided at a supporters' forum that we didn't want this country bumpkin image any more. It's time to move on," explained manager Graham Turner - the swede nevertheless struck back by denying them a potentially lucrative place in the third-round draw. The game itself got off to a cracking start when Tamika Mkandwire's head thumped the ball past a motionless Boston goalkeeper. The Edgar Street roar echoed across the Welsh Marches, a giant-killing coming up. (A bizarre concept since Boston United only escaped from the Nationwide Conference two years ago and are a smaller footballing entity than Hereford.) It wasn't to be. Jason Lee levelled before the break and two goals by Andy Kirk killed the tie in the second half. Craig Stanley's 25-yarder in the last minute of normal time was cosmetic. Some traditionalists will blame the Smithfield Show for interrupting Hereford's FA Cup run. Just when they needed an experienced bull to parade around the running track - a ritual Turner is keen to preserve - they'd all been carted off to London. Several farmers volunteered their bullocks but Turner was put off by visions of a Pamplona moment with a ton and a half of startled beef introducing itself to the crowd. So, no meat and no veg. The famous old stadium wasn't the same. Gareth Sheldon has joined Tamworth based side Bolehall Swifts of the Midland Football Combination, the division below Westfields. The 30 year old has missed the rest of 2010 so far due to injury having originally started last season with King's Lynn. Fleetwood officials told their Inverness counterparts that their wage bill for the coming season was bigger than the SPL side. The Conference side won their friendly 2-1 with ex-Bull Mark Beesley in the lineup. Shrewsbury have quit the South West Challenge blaming injuries and poor pitches. They beat Havant and Waterlooville 2-1, naming former Bulls boss John Trewick as one of their five subs, to reach the final but Havant will now face Blackpool in that match. Barnet are trialling former Burton target Steve Kabba. The released Brentford man was said to be too expensive for the Brewers. Hartlepool are claimed to be on the verge of a takeover according to the local press. They have been owned by oil company IOR for the last 13 years. Ex-Bull Danny Williams has been named as player-coach at Belgian fourth division side RRFC Montegnee, who are owned by English businessman Paul Topping. The club had a brief link-up with Bradford in 2007 and they have former Bantams striker Willy Topp in their ranks. Former Hereford United loanee Gary Hooper wasn't risked today in Scunthorpe's home friendly victory against Sheffield Wednesday. Hooper, 22, has constantly been linked with a move away from Glanford Park with suitors including newly promoted Newcastle United, Championship favourites Middlesbrough and Scottish giants Celtic. "I did plan to play Gary for 45 minutes today", commented Nigel Adkins on their official website. "Obviously I'm aware of the situation that's arising and I didn't want to risk anything. The fact of the matter is he hasn't signed for anybody yet and as everyone knows, there are little things to be done before he signs a piece of paper." "It's fair to say that a situation has arisen where he will probably end up at another football club. But until that happens we've just got to bat on best we can." Update: BBC is reporting that Celtic have had a bid in the region of £2.4million accepted and Hooper will undergo a medical this weekend. Defender Samba Kanoute remains on trial at Edgar Street whereas virtually all of the other trialists seen in the past week or so have left. Kanoute featured in pictures with the rest of the squad at the Open Day prompting speculation that he may be about to sign a contract with the Bulls. Manager Simon Davey told BN that Kanoute had not yet signed but they were talking about a possible deal. Kanoute is a 19 year old Frenchman. They were able to watch the squad training. Purchase some quality Hereford United kit at knock-down prices. Join HUISA and get a discount on away travel! Director Grenville Smith, chairman David Keyte with Keith Hall at the raffle. Former Bull Gareth Davies talking 'off the record' to Keith Hall. Hereford United chairman David Keyte was pleased with the attendance at today's open day at Edgar Street. "Fantastic morning," said Keyte (pictured). "No idea of numbers but all seemed to have enjoyed themselves. Plenty to look at. "A lot of new shirts have been sold. "All part of the positive buzz around Hereford United. Long may it continue." Meanwhile last evening the chairman took the manager and several players to a function organised by loyal supporter Rob Powell on behalf of the MS society. "Very nice evening there. Simon Davey came with five or six of the players," said Keyte. "They really enjoyed themselves for a worthy cause. "I hope it raised a lot of money for them." Finally the question that is on most supporters lips - is Ainsworth returning to Hereford? "We're still negotiating," said Keyte. "Difficult to say more. May be 50/50 and the player has the final say." “Fancy going to Coventry v WBA on Saturday?” asked a chum. Travelling to a friendly at Lydbrook midweek, especially from the Black Country doesn’t make any sense. But yet in other ways it makes perfect sense. An evening at “Reeds” was an essential investment to sustain me through the aftermath of a 1-0 home defeat to Barnet in mid-winter or some such. How can you not be intrigued by ground directions that include the line “the ground is opposite the red phone box”? It is just a ground, bunker-like new changing rooms apart. No cover, no seats other than a few benches under three gazebos for the substitutes and the United board. The pitch has a rail on one side of the ground, a couple of portaloos and improvised but excellent refreshment facilities. The hot dog onions were first class. And that’s literally fine in July for a little village club which seems to have its own weather system. Dark clouds circled overhead all evening but no rain fell upon our heads - unlike in neighbouring areas. Overlooking the ground was a derelict former paper mill. This was a huge, vaguely sinister site which reeked of untold tales. Once it had hundreds of people working there which sustained the local community. Where did they all go? Until the opening of their new changing facilities “despite not receiving a penny from the FA” (as the programme tartly noted), Athletic and their opponents used an upstairs section of the factory to don their football kits. I’m not familiar with the Gloucestershire Northern Senior League but it’s logical to assume Lydbrook are a couple of rungs lower than the hardly-large-themselves Ledbury Town. Hosting 700 spectators was no easy task in these litigious times and Athletic deserve praise for their smooth operation run by enthusiastic friendly people. The admission tickets were among the smartest most impressive I’ve ever seen for a game. There’s nothing to match them in the Premier League for sure. United collectors would be well advised to get hold of one. The result was predictable enough and the details are already recorded elsewhere. The full Bulls first team needed 30 minutes and a goalkeeping error to get into gear, after which the traffic became one way. The weary villagers basically played the whole of the second half in their own half. I’m grateful for Nigel Preece for correcting a classic exiles mistake before it came too embarrassing. He gently pointed out to me that the smartly be-suited mature gentleman to my left wasn’t our club owner but rather Richard Prime of the Hereford Times. “Keyte’s over there in the red jumper drinking from a can of Strongbow.” Not a criticism more an observation of an unusual sighting on an unusual evening. We slipped away a couple of minutes before the meandering end for another brief treat. Supping a pint of Butty Bach at the Saracens Head in Symonds Yat which combines my favourite beer with one of my favourite Shire locations. Beat that. Come the winter I will look back fondly on this night with its gentle victory and all optimism intact.